Where there's fire, there's smoke. And when the fire is more than 200 square miles and growing like California's Rim Fire, there's a lot of it. And in that smoke is quite the witch's brew of air pollutants. Gabriele Pfister runs down just some of the list: "You have carbon monoxide, you have mercury, you have nitrogen oxide, sulfur dioxide." Pfister studies the air quality impacts of wildfires, at the National Center for Atmospheric Research (NCAR). And then of course, you have all kinds of particulate matter, which is what we tend to notice -- the large particles that we see and smell and commonly think of as smoke. But Pfister says, "Size matters." The human body is fairly efficient at filtering the big stuff, by coughing or sneezing it out. It's the smaller stuff that's more insidious. "This is not just a local issue." "The smaller they get, the more likely you breathe them in," says Pfister, "deeper into our lungs and all the way into the bloodstream they can go." That, she says, can contribute to respiratory and heart ailments later on. And these things get around. Pfister says the pollutants can rise six miles into the air and there, driven by high winds in the upper atmosphere, can end up contributing to air pollution hundreds of miles away. "It's not infrequent that we here in Colorado see smoke from wildfires in California," she noted. "This is not just a local issue." On the contrary, it's "global" in the literal sense when you account for the greenhouse gases, which include carbon dioxide, water vapor, methane, and black carbon, though fires remain a relatively small contributor to global warming, compared to the more intentional burning of fossil fuels. And Pfister notes, perhaps searching for something positive in all this, that at least when the forest grows back, it will resume siphoning CO2 out of the atmosphere and storing it again. And she adds that some of the particle emissions, or aerosols, tend to "scatter sunlight" and create at least a short-term cooling effect. Given the generally accepted forecast of more intense fires driven by climate disruption, however, Pfister expects wildfires to become a larger share of the overall air pollution problem. As for calculating exactly how much gunk is going up there, Pfister says that gets complicated. She says part of the problem is in how you define "smoke," and when it's heavy enough to constitute a plume. 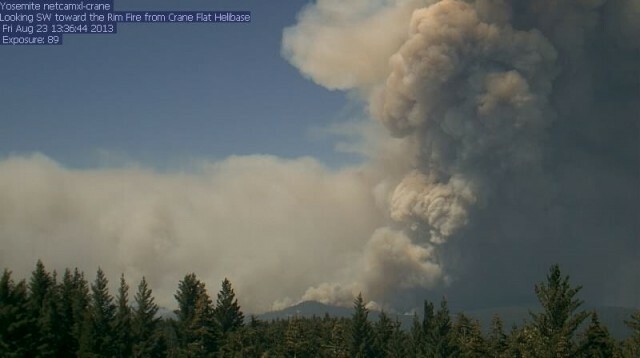 "Then it depends on how big the fire is, how much biomass is burned, how active is the fire (is it flaming and strongly convective, is it laying down and smoldering), how fast and slow the winds move the smoke," and so on. Larger "fallout" can cause different types of problems. Early this week, officials were grappling with how to respond to the ash raining down on San Francisco's Hetch Hetchy Reservoir, near the fire's eastern front in Yosemite. The fast-growing blaze posed potential problems for both the water supply and hydropower output. Monday, city power officials had idled two of the dam's three hydropower units as the fire advanced.